Nick Robinson, The Blond and Beeb camera crew get set for an interview yesterday lunchtime next to Team Boris HQ in County Hall. There were a bunch of broadcast one-to-ones outside after Johnson had given a short speech to hacks who'd been at the Livingstone launch. Capital Radio, LBC and ITV London were there too. Being last in line, audio gizmo clutched in freezing hand, I was free to observe the scene. 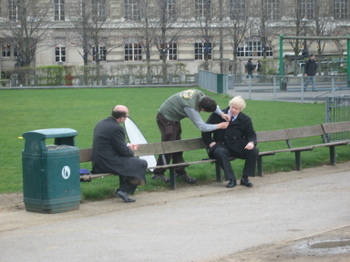 Johnson seemed right in his element, performing all the necessary, silly telly tasks - thoughtful stroll towards Millennium Wheel, thoughtful stroll back again - with patience if not pleasure and bantering gaily with Robinson and Jones. It was all terribly chummy. You'd expect that, of course, Johnson being gregarious, Westminster being a village and so on. Was it a bit too chummy, though? At one point during his interview with Robinson - a clip from it went out on last night's Ten O'Clock News (see Audio/Visual News here) - Johnson mentioned their being at Oxford together. Too matey, mate: ask Nick. I suppose that stuff all goes a bit against the grain with me, but then I'm probably even less clubbable than Ken. I got my breezy minute with BJ walking-and-talking to his waiting cab. As I mentioned yesterday, I wanted to ask two questions that had occurred to me during Livingstone's launch: how would Boris help sustain multicultural harmony and how does he intend reforming the mayoral institutions? It was all very rushed and the sound quality crumbles towards the end, thanks to a blustery wind. I might transcribe some of it for you later but HAVE A LISTEN for yourselves. The exchange of greetings at the start is between the candidate and two guys on the platform of a heritage Routemaster. The gist of Boris's remarks is that he's all for celebrating diversity and encouraging belonging, but where grant-giving is concerned he wants the LDA to make sure its money is spent more wisely. He also stressed "additionality" - getting the City to give more. On the balance and use of power in and by City Hall, he seems to want to enhance the scruinising powers of the Assembly, though I'm not sure how he'd bring that about. And would he really want to once in City Hall? Asked if there'd be any announcements on constitutional change, he hesitated and said, "Wait and see." Thanks Boris, I will. I'm also hoping to hear more about the appointments he would make if he won. The Standard Diary yesterday listed Winston McKenzie, Lurline Champagnie and James Cleverly as contenders to be "race-relations" adviser. And who would help him with, say, transport? I think we should be told.